A selection of early 20th century design patterns and bound sample albums highlight the importance of original prototypes for the decorative arts. Created by professional designers in the traditional technique of gouache on paper for various trades, including textiles in Lyon or porcelain in Sevres, these preliminary works are as fresh as the day they were painted. Original material culture on paper rarely survived the rigors of the workshop. The detailed graphic power, the vibrant palette, and the resourceful handling of page layouts give these practical drawings an extended life. A combination of utility and artfulness establishes their appeal to our modern eye. 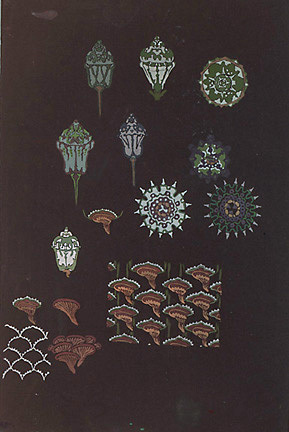 Emile Didier (Lyon, 1890-1965), France, Lace Design, gouache on paper, 19 x 12 3/8"
Arthur Litt, Textile Design (Dessins Industriels 36626), c. 1920-40, gouache on paper, 5 1/4 x 8 1/4"
French, Textile Design, gouache on paper, 7 1/8 x 5 1/2"
Maurice Leonard (Lyon, 1899-1971), Two textile designs, early 20th century, gouache on paper, 20 x 13"
French, Textile Design, gouache on paper, 5 1/4 x 4 7/8"
Column Design, gouache and gold leaf on paper, 125 x 20 1/4"